Wassail! Enjoy 20% off your drink tab this Tuesday — 1859 Cider Co.
You may know the celebration of Wassail as a time to go caroling and enjoy a mulled cider. What you may not know, however, is that this old English tradition historically was celebrated as a drinking ritual. Caroling would take place in the orchards and a toast was given to ensure the health of the cider apple harvest the following season. Instead of freezing in an orchard come down to toast in our warm and cozy taproom this Tuesday. We'll be offering 20% off your 1859 drink tab as our way of saying thank you for blessing our orchards for 2017 so that we can ensure to continue to pour our pure fruit ciders. This Wednesday, January 18th, our cellar assistant Michael will lead a hands on workshop on fermenting your own Kimchi, a traditional Korean side dish made from fermented vegetables packed full of spice and healthy probiotics. We have about 5 spots left for this event. The cost is $25 and includes a $10 voucher towards your drink tab. If you choose to join us please register on the sign up page here. 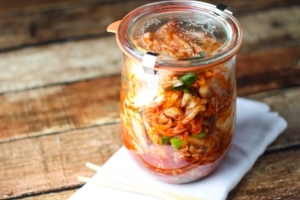 At the end of the night you'll go home with two jars of kimchi. For this event we'll provide the jars and necessary ingredients but you're resposible for bringing a standard cutting board, large chopping knife you are comfortable using, and a large mixing bowl. Every Sunday you can learn something new by visiting the 1859 taproom. From 6pm-7pm learn how to sign and create real conversations in our colorful and social American Sign Language class. This a free one hour lesson taught by members of the deaf community. This is the perfect opportunity to learn a new skill and interact with the deaf community here in Salem. Learn more on our website or Facebook page as each week will have a specific focus. At 7:30 Salsa extraordinaire Debra Seeck leads an introductor Salsa lesson which shows you the basic count, steps, twirls, and hand loops. After the lesson show off your moves for open dance from 8pm to close. Any level of experience welcome for this weekly party. There is a $5 CASH cover charge paid at the door upon entry. Newer PostCherry Blossoms, Love Birds, and Birthday Cake! Older PostRing in 2017 w/ Live Music and Cider Mimosas!